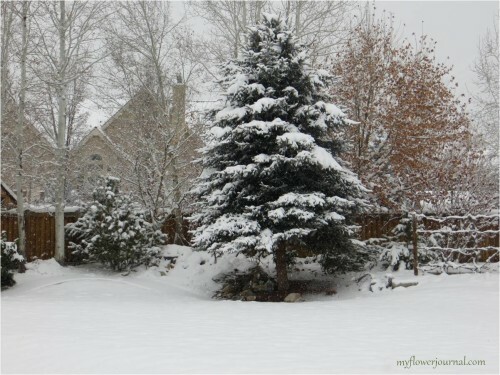 Last week Mother Nature gave us two beautiful snow storms that left our Utah neighborhood looking like a winter wonderland. The day of the first storm I had a list of errands to run, but as the snow accumulated I decided to stay home and off the icy roads. 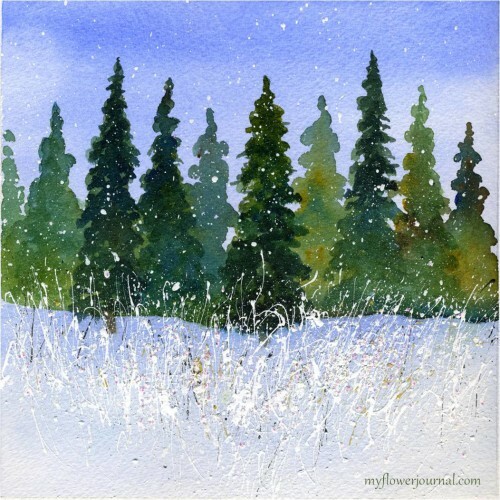 I used this time to create my own winter wonderland by painting a winter watercolor scene with splattered acrylic paint. The winter watercolor scene I painted and splattered with acrylic paint. Watercolor paper, fluid acrylic paints, glitter, masking tape, ruler, paper towel, round bristle brush (I’ve tried a lot of different brushes and this one works the best. ),disposable plastic table cloth or something to protect your work area from paint splatters. Tape a piece of watercolor paper to a board. Mine is 8×8 inches. 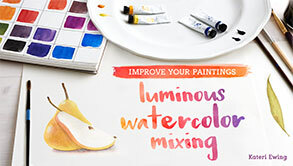 Do a blue watercolor wash with the color darker at the top and getting lighter towards the bottom. Watercolor dries light so do it darker than you think. 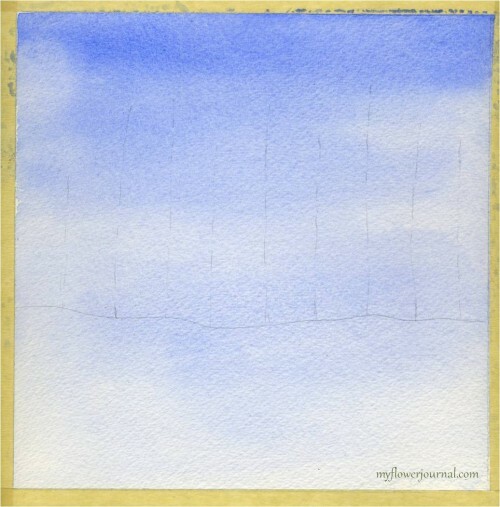 When its dry lightly draw a horizon line and vertical lines where you want trees. Paint tree shapes using watery mixes of greens, blues, burnt sienna and yellow ochre. Let the colors run together and mix on the paper. Make sure they are different heights and shapes. You don’t want them to look to perfect. After the trees are dry darken a few of them so they look like they are in front of the other ones. Darken the snow shadow just below the horizon line and let it fade out to white. While it dries get ready to splatter. 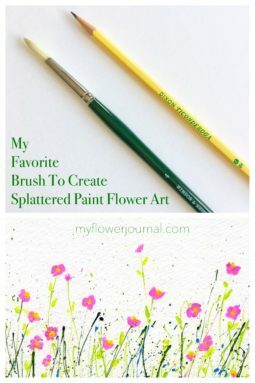 You can find tips for splattering paint here and easy clean up here. A video of how I splatter my paint is here with some FAQ. Cover the trees with a piece of paper towel. Using a size 8 round acrylic brush and acrylic craft paint splatter a little yellow ochre and dark brown paint on the snow area to look like weeds or dry grass. Clean your brush well then splatter white paint. Take off the paper towel and splatter more so it looks like the snow covered grass is in front of the trees. Using lots of paint on your round brush with give you long grass like splatters and a few that look like snowflakes. I added more splatters to look like falling snow using an old toothbrush. Rub the toothbrush in a little white paint. Work it into the tooth brush. With the bristles facing down rub the brush across your index finger. Try a few splatters on a piece of scrap paper. When you are happy with your splatters do it on your painting. If you have too much paint on your toothbrush you will get big gobs of paint instead of little snow flakes. Before the paint drys you can add a few sprinkles of a clear glitter to give your snow a bit of sparkle. Video and FAQ can be found here. 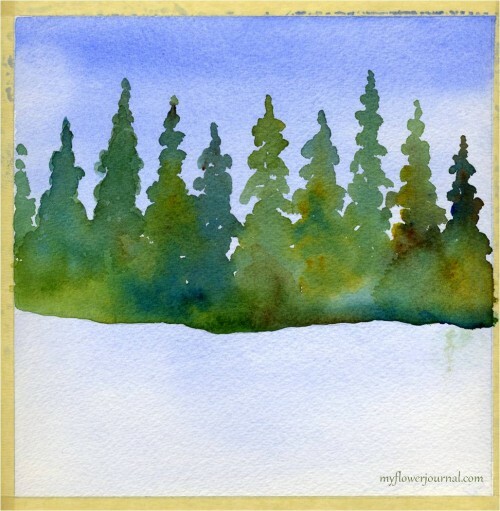 More winter art ideas can be found here. What a lovely snow scene, you’ve painted, Something for me to try when the Christmas wreaths and garlands are made, and the cards are sent. It is so delicate, lovely! Your artwork is gorgeous–I could spatter paint from here to Tuesday and it would never look as good as yours does! It’s beautiful. thanks for the steps and explonation! Wow! Love the splatter effect and it’s really cool to see the layers that go into your art! Happy PPF! Beautiful Snow scene! Thank you so much for sharing your process! Great tutorial, love the painting! So atmospheric! WOW,What a amaizing winter paintings,Love the white splatters,beautiful. Tammy, how inspiring! I am going to try this today. I know I can’t achieve the sharpness and beauty that you have but it looks like it would be such fun to try. Oh I love this – it’s beautiful! Just lovely Tammy! Thanks for showing your steps. my backyard looked like your on Monday-and now we’re supposed to get more tomorrow and Tues-NOOOOO! 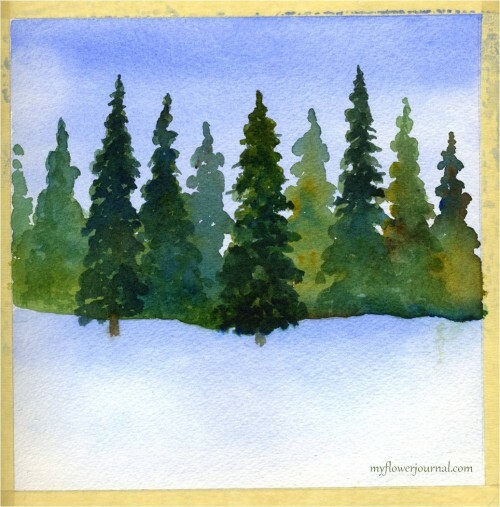 However, I LOVE your latest watercolor paintings of the winter scene!! I really like this! 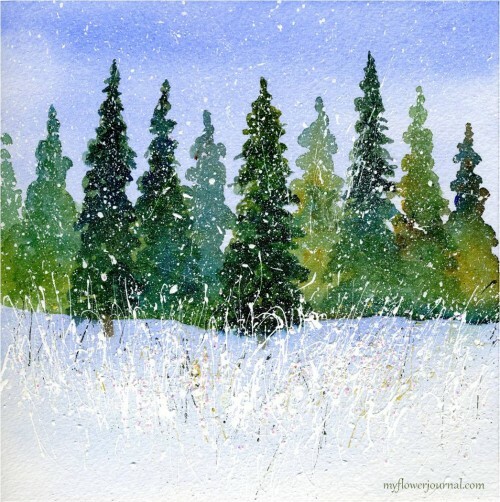 At first I guessed the snow was accomplished with masking fluid… but how smart: acrylic! Great idea and effect. Beautiful scene with that dancing snow – love it! You are so generous with your tutorial…what a gorgeous scene….thank you so much, I hope much is returned to you in a big way!! How gorgeous!! Super tutorial too. Those trees are looking amazing with the bright snow. Very wintery! Nice!! What a great technique. I love this painting!!! 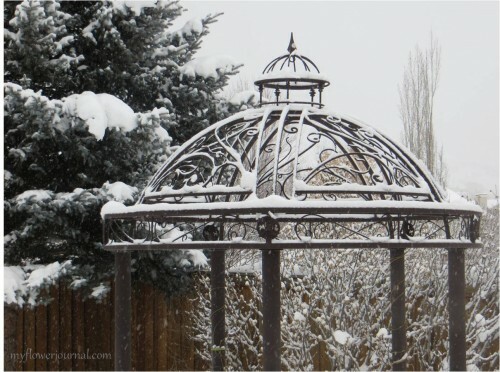 what a gorgeous piece…and the white adds so much texture like snow falling!!!! I really miss your posts. Your works beautiful and inspirational. I am SO inspired! Thank you for sharing this lovely painting and the progression of creativity which brought it to life.